Anna Signeul admitted her Scotland side have concerns over the state of the pitch they will play Macedonia on in their next Euro 2017 qualifier. 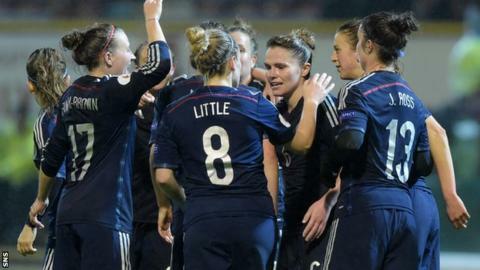 Scotland women returned to the top of Group 1 with a comprehensive 7-0 win over Belarus at Fir Park on Friday. However, the Scots have been told it is unlikely they will be able to train on the Skopje pitch before Tuesday's game. "We watched Macedonia play Iceland and it was almost dangerous, with puddles on the pitch," said Signeul. "We'll see, but we just have to manage that and play with a heavy and wet pitch. "We don't have a long recovery. We took off Rachel Corsie and Jennifer Beattie and that's because they have niggling injuries. We saved them a little bit so I hope that they can play on Tuesday. I thought they were excellent, both of them." Scotland initially struggled to break down Belarus as they looked to build on last month's 3-0 win in Slovenia, with Jane Ross's header the only difference between the two sides at half-time. They were a different prospect after the break, with Caroline Weir, Lisa Evans, Corsie and a second from Ross making it five, before Jo Love scored a double late on. "When you play teams like this you need to be patient to break these teams down, we knew that," said Signeul. "In the first half we tried to push the final pass a little too early - play it direct into the centre where it was very crowded. In the second half we played a little bit wider and we played a little bit more from out to in and circulated the ball quicker. I thought it was a fantastic performance. "We had spoken about two things specifically - press as a team and win the ball back quickly and work hard together. The second thing was to be patient and have lots of movement, and if you look at the movement it was fantastic in the first half, it was just the ball didn't go as fast as we wanted it and as wide as we wanted it at times. "They wanted to slow us down, they wanted to crowd the centre, to give no space for us at all. So it's not that easy to just think you can go in and score a lot of goals. But we do it and I think that's fantastic." While Scotland have doubts over the fitness of Corsie and Beattie, defender Ifeoma Dieke has missed the trip to Macedonia after suffering an injury. Dieke was honoured pre-match for reaching the 100-cap mark, however had previously missed nearly two years of international football after rupturing her anterior cruciate ligament while appearing for Team GB at the 2012 London Olympics. "She unfortunately has problems with the back of her knee - we don't know really; hamstring, calf," revealed Signeul. "She's going to get an MRI scan on Monday so she's definitely out of Macedonia."